Tracking your data usage becomes extremely important if you are having a limited data internet connection. It lets you see how far you have gone and how far you still can go in the surfing highway. Windows 10 gives you the option to see the data used in last 30 days with just few mouse clicks. 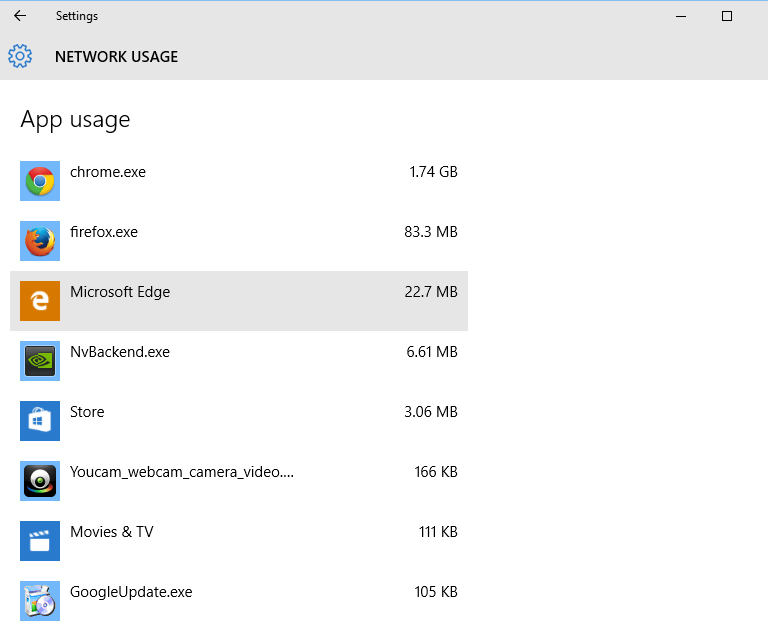 Add to that you can also see the bandwidth usage by different apps. The secret advantage of this additional feature is that you can also, track which app eats your bandwidth by updating itself, even when you are not using it at all. 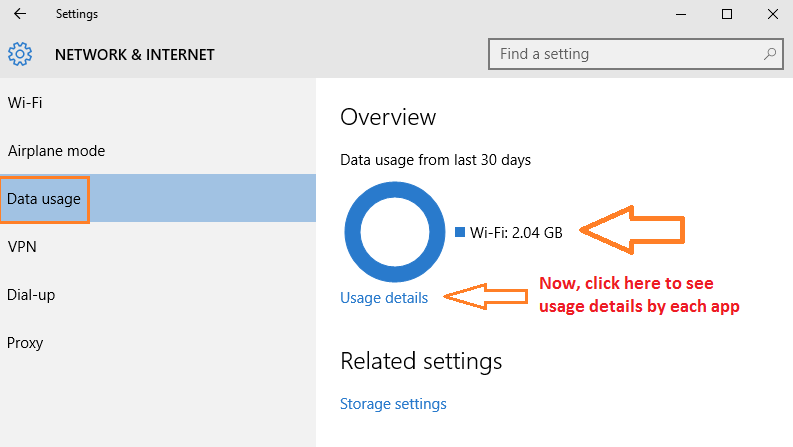 Let us see how to view your windows 10 internet data usage details. To view how much of the internet data has been consumed in last 30 days, just follow steps below. 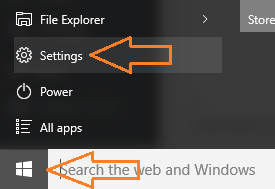 Step 1 – click on windows start key and then click on settings. You can also press windows key + i on your keyboard to open settings. 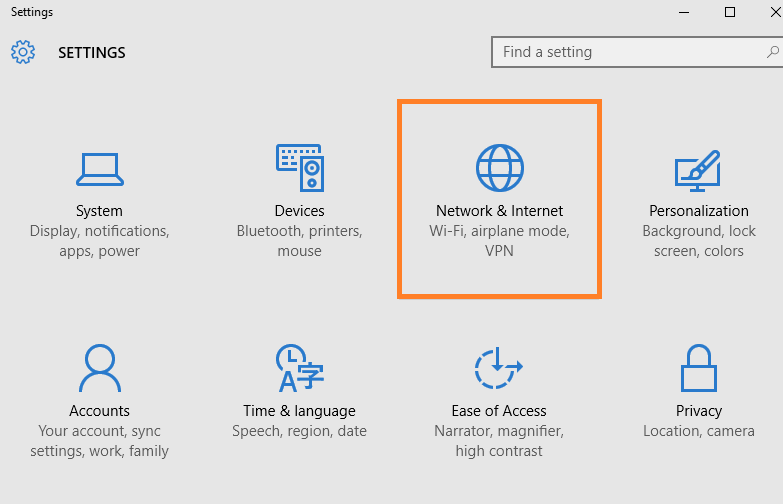 Step 2 – Click on Network & Internet in the system pane as shown below. Step 3 – Now, click on Data usage in the left menu. You will see a screen in the right showing your data usage in last 30 days. Note– If you are currently connected to a Ethernet connection, it will show the usage details of Ethernet connection here. Note that it only gives the usage details of connection you are currently connected to. If you switch between wi-fi and Ethernet, the usage details will be bifurcated. That means if you are connected currently to wi-fi it will only show you the bandwidth used in last 30 days by wi-fi connection. It will not show you the data usage by Ethernet connection. Step 4 – Now, click on the usage details link given below the circle and you will be at a page which list data usage details by different apps in your PC. Looking at the above screenshot from my PC, you can easily see how much i use the chrome app. You can also see app usage details by task manager. 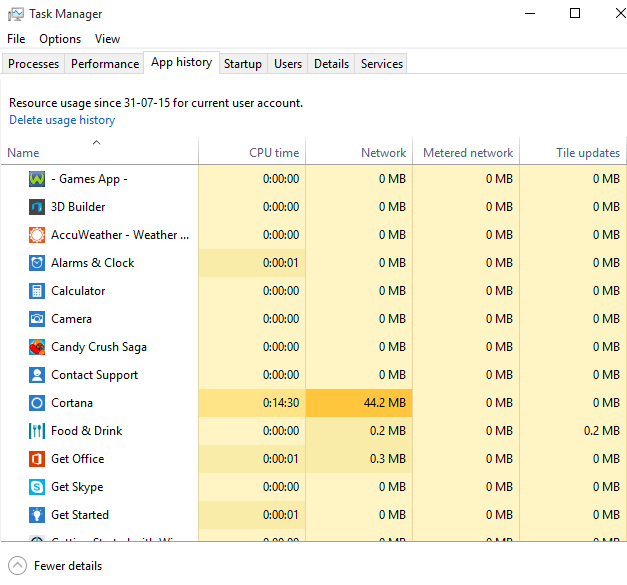 Alternatively, you can also open task manager and click on App History tab and then you can see the data usage by different apps. The only glitch i found using this method is that it does not provide usage details of chrome app.